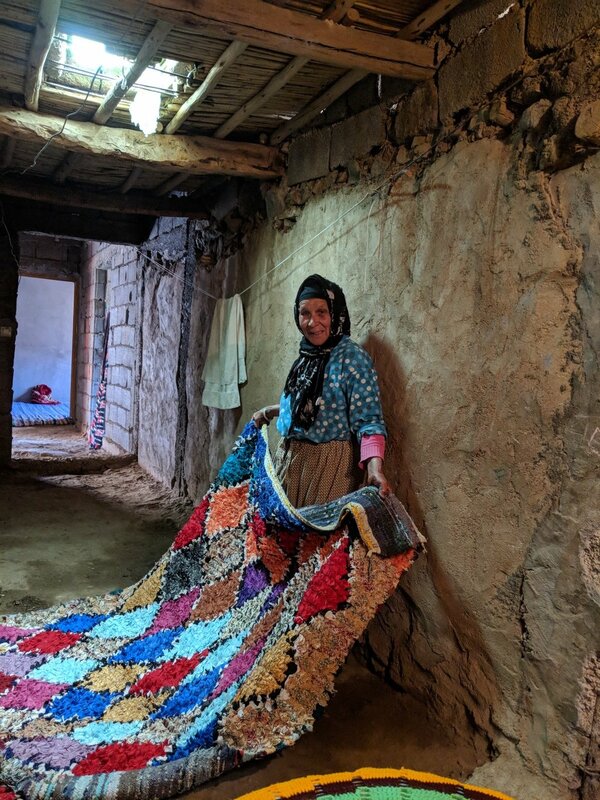 At A New Tribe we’ve spent many years working with the Berber people in Morocco, who both weave our in-house designed rugs and who we source our one-of-a-kind vintage rugs from. During this time, we’ve learnt so much about the different tribes who make these rugs, and how to tell each type of Moroccan rug apart. The term ‘Berber rugs’ has recently been popularised, and is often used to describe the monochrome Beni-Ourain rugs which have had a resurgence in recent years. The truth is that all Moroccan rugs are in fact Berber rugs, as they are all made by different Berber tribes in Morocco. However each tribe has a distinct style - which often comes about because of factors such as the local resources, native plants for the dyes and the climate of each area. Traditionally Moroccan rugs were made solely by women for use within their own homes, to adorn the floors and be used as seating covers, bed-covers or blankets during the colder months. The rugs are filled with symbolism and often tell a story of the woman who created each piece. Each rug takes around 20-30 days to be hand-woven and the design is always completely original - no two are ever the same. 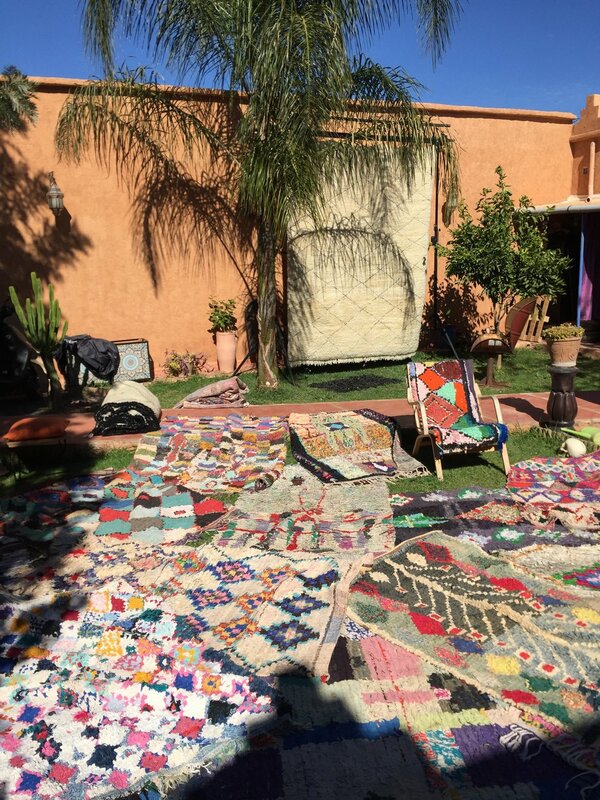 We wanted to share this insight into the wonderful world of Berber rugs with you, and explain a bit more about each type of Moroccan rug that we stock. Azilal rugs often tell stories through their use of bold colours and patterns. 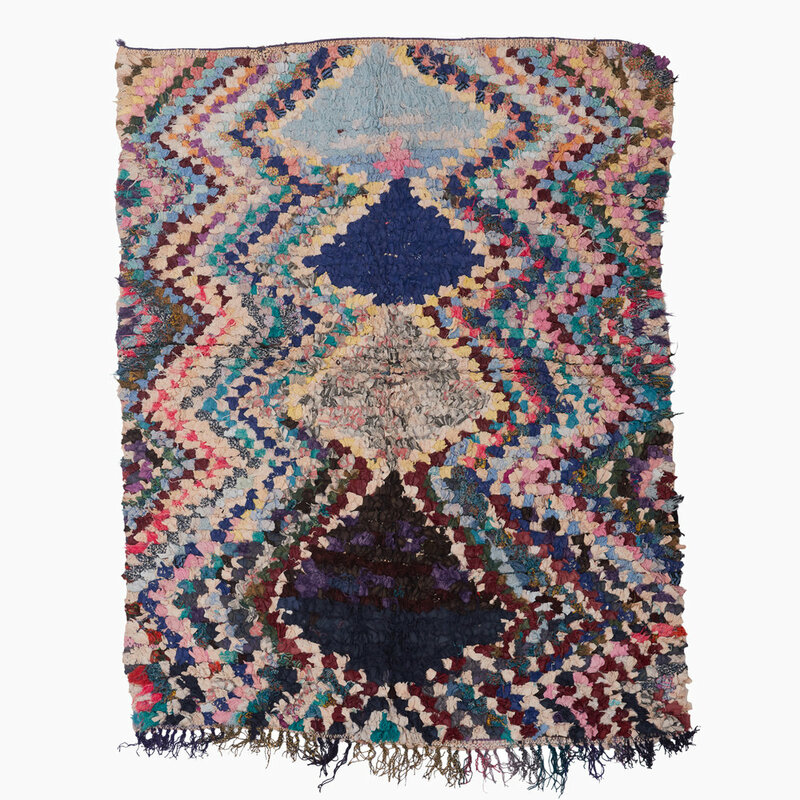 Originating from the high Atlas mountains, these sought-after creations are single-knotted, and woven in wool with intricate patterns and symbolism. The base of an Azilal rug is mostly a light shade of cream or white - the natural colour of the wool used - then woven with brightly tinted wool coloured by the regional flora. Boujad rugs most often appear in warm red, pink and orange hues. 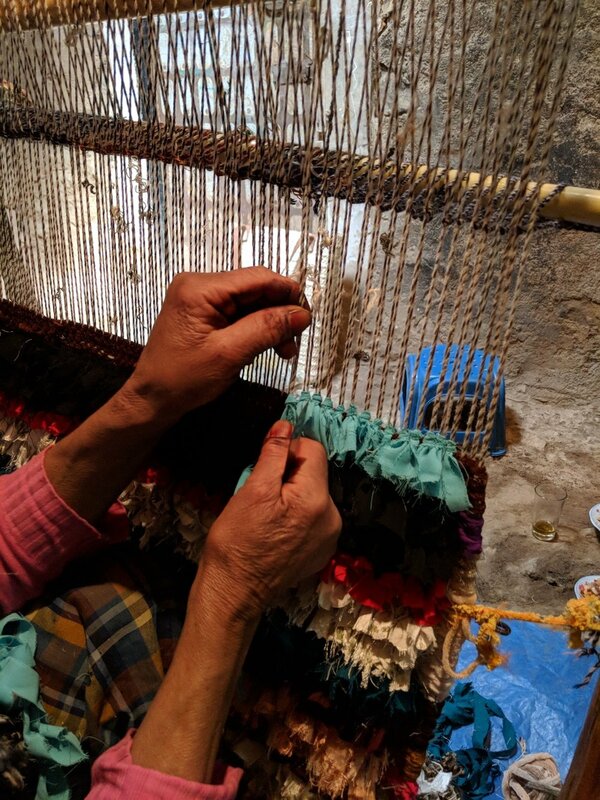 They are created with the typical knotting techniques practiced by Berber tribes - but with the knot being pulled tighter, the rugs require less wool. 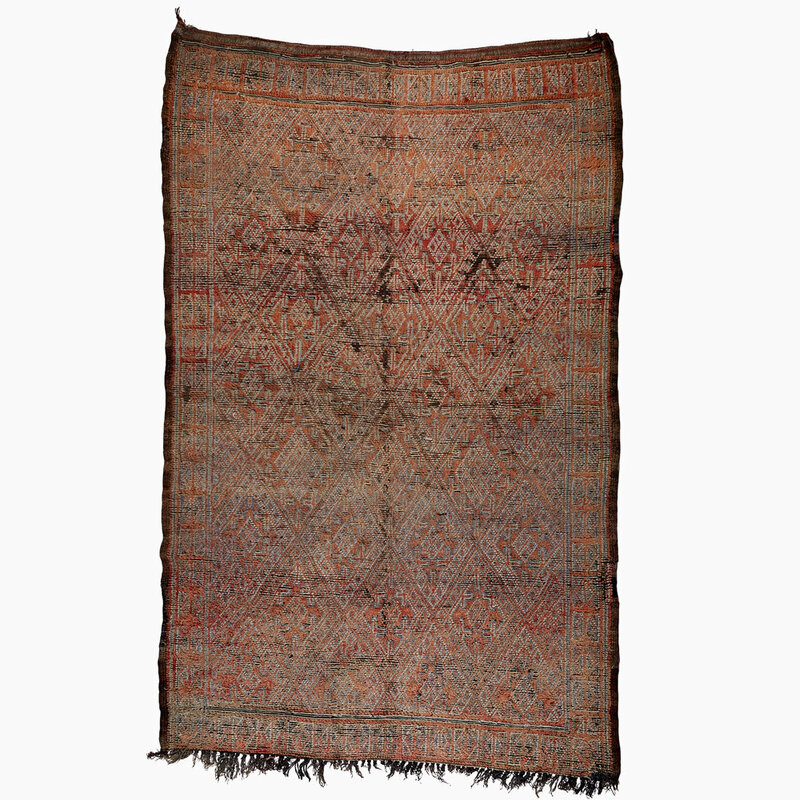 This enables the weaver to create the intricate geometric patterns that Boujad rugs are famous for. The colours are created by natural dyes - from flowers, berries, leaves and henna. The Boujad area is a wider area of Morocco rather than one small tribal location. Contrastingly, Beni Ourain rugs are beautifully muted in their colour palette. Their shades can range from cloud white through to sandy cream, and their light tones lend themselves perfectly to spacious minimalist homes. Created by the Beni Ourain tribe in the Middle Atlas, each rug is adorned with soft black or dark brown geometric patterns and lines. The design on each rug is often asymmetrical and mismatched, adding to its charm. Each type of Moroccan rug differs in thickness due to varying temperatures throughout the Atlas Mountains - and the Beni Mguild rugs from the harsh far western Middle Atlas region reflect this in their plush, thick weave. These rugs are often woven on a vertical loom and come in deep shades of blue, purple, brown and red. To adapt to seasonal changes, the rugs can be flipped to show the flat side during warmer months when the thick pile isn’t required. One of the most playful and visually captivating types of rug are Boucherouite - created originally out of a need for warmth, in areas where there is no or little access to wool. These rugs are crafted from scraps of fabric and old clothing, making them a wonderful example of practical recycling. The rag rugs are durable, with bright colours and an incredibly tactile quality due to their unique texture. Kilim rugs are a startling contrast, and can be found adorning the tents of Berber tribes in the desert. The rugs are completely pileless and flatwoven, making them lightweight and more easily transportable. These thinner rugs lend themselves to hotter climes, and can be used to create a carpet that fills an entire room’s floor space. The creation of rugs for warmth, practicality, tradition and storytelling are an inherent part of Berber culture - and we’ve merely scratched the surface on the endless tribal variations. If you’re intrigued and want to know more, read our previous blog post about Berber history and culture.